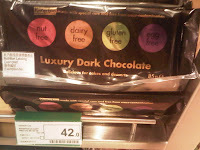 There is definitely this gluten free dairy free egg free nut free plain luxury dark chocolate available at Oliver's. It is pretty heavenly I must say (8/10). But how about the main stream brands? Which ones could I continue enjoying? This is my quest for the year. I've included links to the official websites. Toblerone - see Kraft Australia - yes most of the products of this brand is GF, except the new honeycomb. Hershey - N/A.. umm, I dont eat Hershey. Haagen Dazs Contains gluten only if specified. Hurray!!! =) Example of GF ice-cream include Chocolate, "Vanilla, Coffee, Strawberry, Extraas™ Rocky Road 500 ml and Banana Strawberry Frozen Yogourt Bar." I-scream and XTC are processed in facilities that also process wheat/gluten containing food.